Did you know it’s human nature to focus more on the negative than the positive aspects of life? In other words, instead of challenging the highlight reel of our lives that play in our minds, we simply accept the falls, setbacks, challenges, and disappointments as the reality of our lives. Looking back, we completely ignore the wins, hell-yeahs, and situations where we blew our expectations out of the water. Looking ahead, instead of questioning the story we tell ourselves of what will likely happen if we walk out on that limb, we simply believe it’ll crack under our weight, and we’ll tumble to the ground in a heap of regret and humiliation. This tendency, my friends, is sadly part of our wiring. Our brains make it easier for us to look at our lives through the negative lens and our Inner Bully is the voice we hear that loves to remind of the less than rosy view and paints a rather dull picture of what could be. Related Topic: Listen Up! Your Inner Bully is Trying to Tell You Something! As we hit our 40s and enter the midlife transition, these voices seem to become stronger and it feels harder to resist them. When we’re fully in our Midlife Muck, we’re actively trying (or hoping) to change all the things that aren’t working. That leads to a whole-lotta fear because we don’t know what’s on the other side of that change. So, our Inner Bully flexes its muscles and rides the brain waves that naturally like to point out the negative. But, to give in to this negative focused mindset means we stay stuck and live a smaller than ideal life. So, today, let’s talk about how we can actively and intentionally focus on the positive instead of the negative. There’s a scientific reason why we, as imperfect humans tend to lean towards the negative side of things. To put it bluntly - our brains are hard-coded to react more strongly to the negative. This reality is based on the concept of the negativity bias. The negativity bias means that we over-inflate the possibility of a bad outcome and better remember our “failures” than our successes. Negative thoughts, comments, feedback, experiences, etc. all imprint more quickly in our minds and tend to stick around for longer than positive ones. Think about it, let’s say you had a performance review by your boss at work. If she listed off ten amazing things that you do incredibly well, but then casually mentioned one thing that you could do a little better, what stays in your mind after that meeting? My guess is that it’s that one little thing, as opposed to the ten amazing things. We have this built-in protection system that attempts to keep us out of harm’s way. Unfortunately, when we allow it to have full control of our thoughts and feelings, it keeps us from the good things in life too. Over the course of our lives, we’ve finely tuned this muscle and seeing the less than rosy side of things, or imagining the worst-case-scenario, is an easy crutch to lean on. The problem with this is that when we need or want, to make changes in our lives, it’s a lot harder to take the risks we need to take when we believe it’s only going to lead us to disaster. What makes this all the more interesting is that even though the negativity bias impacts both men and women, studies show women internalize it more than men. That means that we tend to carry it with us longer and it impacts our choices and actions more than men. 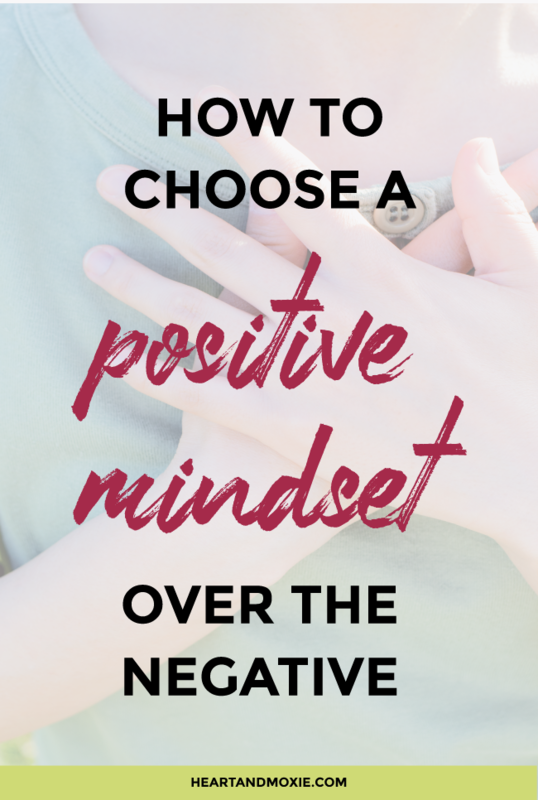 So, how to do we deal with this negativity bias and not allow it to derail us from the life we crave? Since this tendency is part of our hard-wiring, I’m not going to tell you to try to get rid of this line of thinking. We can’t - it’s part of our brain. But, that doesn’t mean we can’t learn to work with it differently. So, how do you start to rewire your brain to see and hear the negative, but to intentionally focus on the positive? The first step is knowing that this part of all of us. We all have this tendency, but how we each choose to deal with it is what makes us unique. The easy path is to believe what that bias shows and tells us. To focus on the positive, we have to challenge those negative thoughts. We have to recognize that this is human nature to jump to this viewpoint, but that doesn’t mean we have to give it life. We can recognize that it’s coming from a place of protection for us, but we can also be adult enough to realize we don’t need that protection. After we allow ourselves to be aware that the thought we’re having, or the memory we’re dwelling on is not how we want to focus on things, we have to actively and intentionally rewrite the thought. If it’s a memory you’re dwelling on, then go back in your mind and pick a different memory. When did you succeed at something? When did you get a compliment? When did you feel on top of the world? If it’s an outcome you’re anticipating that’s not so rosy, then rewrite the outcome you’re envisioning. It hasn’t happened yet, so it’s just as easy to create a story around a positive result than a negative outcome. Related Topic: How to Rewrite those Fear Stories! Finally, reject the negative self-talk. When your Inner Bully starts telling you that you “can’t,” challenge that voice and tell yourself that you can. Visualization is the practice of imagining the life you want and seeing it happen in your mind. But, the key is actually to believe that it’s possible while envisioning it unfolding. The power of visualization is that our brains don’t necessarily know what’s real and not real. The feelings that we get from both still flood our bodies because our brain sees the visualizations as an actual event. Think of it like this: Imagine tasting a lemon. Imagine it’s sourness and tartness. I bet as you read that description and thought about biting down into a slice of lemon, your mouth started watering. You didn’t just eat a lemon, but your body reacted as if you had! That’s how visualization works. Your body will react to the images you visualize of the life you want. As a result, you’ll start making different choices in your day-to-day life to activate the life you want. How does this tie into focusing on the positive? Well, when you’re visualizing the life you want, I seriously doubt you’ll envision yourself living a small life and beating yourself up. Now that you know all of this, you might be wondering how to begin to implement this in your life. You’ve already achieved the first part of becoming aware that this is how negative thoughts work and why you have them. Now, it’s working with that knowledge. My recommendation is to grab a notebook or your journal, and for a week, jot down all of the negative thoughts that come up for you. Then, start to rewrite them in your mind. As you hear those thoughts come up, catch yourself and intentionally think the opposite. Also, start practicing your visualization each day. You can layer this onto an existing meditation practice, or just focus on the visualization piece. Finally, recognize that you’re not perfect and that’s okay. Trying to change how you think and the lens through which you view your life takes practice and time. It does get easier, so don’t give up on yourself or beat yourself up if you have a day that doesn’t quite go the way you want. It’s a process and an imperfect one at that, so all you need to do is make a commitment to yourself to be conscious of your thoughts and to keep working on changing them little by little. Consider this a marathon, not a sprint. The marathon runner wasn’t able to run those 26.2 miles on day 1! That first mile or two took a lot of hard work to achieve, but it eventually became the easiest part of the race. Look, I can’t give you a magic pill, or even a magic formula that will instantly allow you to focus on the positive and reject the negative. But, by merely knowing we have a choice in what we believe about ourselves and our lives (past, present, and future), we hold the key to unlocking that door and changing things. Focusing on the positive takes practice since it’s not a natural state for many, but it is possible to change the course of your thoughts. And, as with any exercise, the more you work the muscle, the stronger it gets. 5 Tips to Tame Your Inner Critic and get out of your Midlife Muck!